I was just looking through some old email and found this picture that Cheryl K sent of Scout and Chase when they had their big date back in October. Little did we know that Scout was already pregnant with the Ocho! Chase loves Scout -- and I think it's mutual. 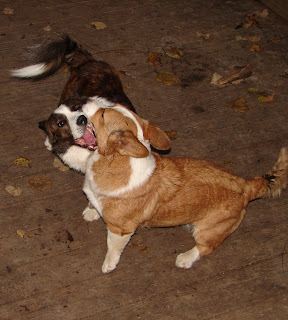 That picture of Chase chasing Scout through the gate that Penni had posted on her blog...you can just tell they genuinely like each other! Or at least chasing each other, LOL.